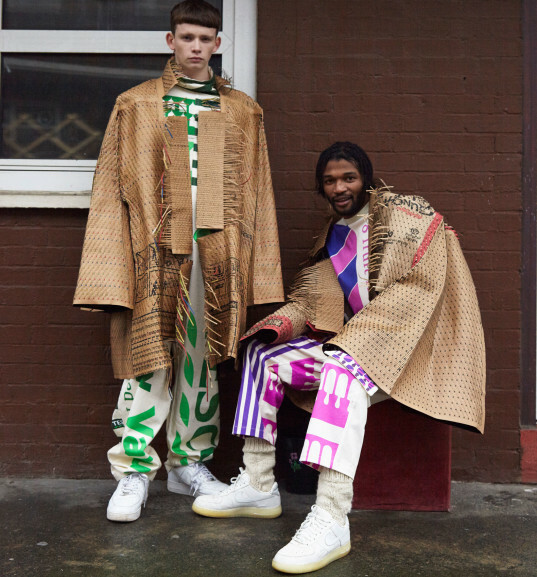 For London College of Fashion alumna Bethany Williams, clothing is more than something we wear; it can also be a platform for neglected social issues. 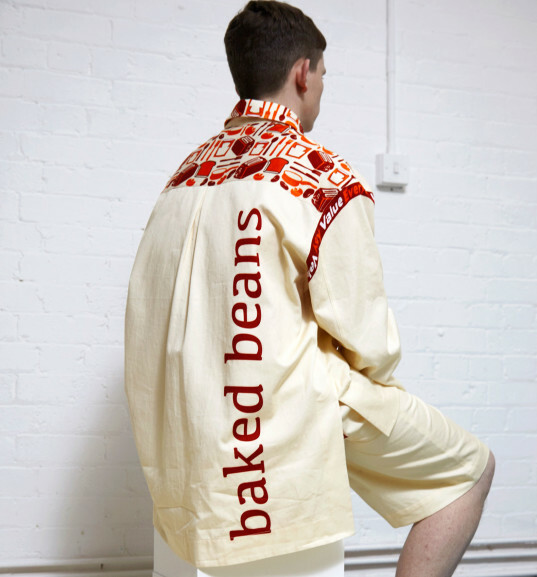 With "Breadline," a menswear collection she developed as a graduate student, Williams worked with grocery giant Tesco and the Vauxhall Food Bank to draw attention to the United Kingdom's hidden hunger crisis. Williams devised a program that allowed food-bank users to exchange household-waste items for fresh fruit and vegetables from Tesco. 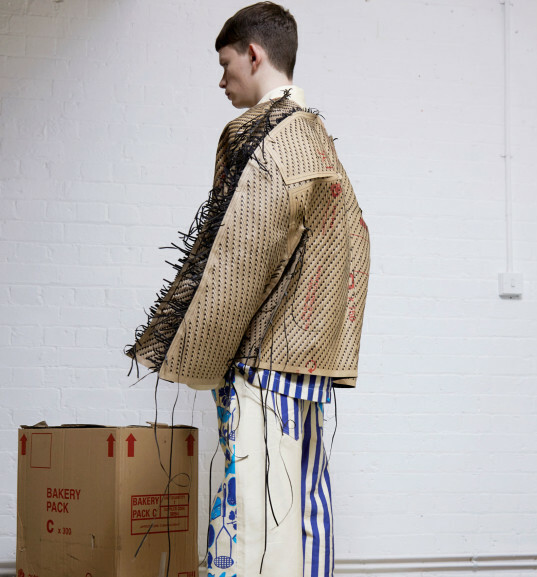 She then combined those waste materials with secondhand garments, recycled cardboard, and graphics from Tesco's "Everyday Value" branding to create her looks. In this exclusive interview, we asked Williams about her design process, her thoughts on "alternate" systems of fashion production, and the role fashion can play in driving positive change. Have you always tied together your passion for fashion and social causes? My family is very creative, caring, and concerned about people and the environment, which has had a massive influence on my practice and how I view the world. Their views and beliefs have provided the foundations on which my work is built on. Before the London College of Fashion, I studied fine art at Brighton University, which was amazing. The course gave me my interest in critical theory, which is the backbone of my work. I’ve always been interested in fashion and art but as a student I found it very difficult to combine both disciplines. I chose a degree in fine art but always felt I had to justify the use of garments within my practice. Through the creation of my bachelor’s degree project “Roofless,” I was able to combine all my interests and I know this is what I want to do with my life: help people, create art, and design clothes. The course also introduced me to the way art practices provides alternative systems for today’s social structures and services while attempting to run against globalization’s homogenizing tendencies. This led me to the idea of altering the production and selling process. I hope the buyer will question the existing process of commerce and see the available space for an alternative system. “Breadline” is the result of several collaborations, including one with Tesco. How do they build upon one another? Through my practice, I want to not only comment on a community, but also work with its members to create change by generating profits for charity. “Breadline” particularly wants to highlight and help find solutions to the hidden hunger in the U.K., specifically working alongside the Vauxhall Food Bank and Tesco to achieve this. I developed an exchange of fresh fruit and vegetables, from Tesco, for waste items from the food-bank user’s household. I created the collection using these waste materials, plus recycled cardboard and Tesco’s “Everyday Value”-branded organic prints, all donated by Tesco. We will be donating 30 percent of profits to the Vauxhall Food Bank, continuing the cycle of exchange. Do you consider “Breadline” an eco-friendly collection? Through traditional handcrafted techniques and working with local craftspeople, we developed the surface of these waste materials to create handcrafted woven, printed, knitted and embroidered materials. This exploration led to the development of a new fabric, constructed from cardboard, which is handwoven in the U.K.
Every one of our garments is 100 percent sustainable and made in the U.K., even down to the buttons which are hand-rafted in the Lake District from our collaborators own planting of trees. Each denim look consists of nine pairs of recycled jeans and each knitted look consists of six jumpers. I also want to let the consumer know who exactly made their garment and how long it took to produce. I’m trying to provide an alternative system for fashion production, as I believe fashion’s reflection upon the world can create positive change. What was your design process for “Breadline”? My design process stems from the concept and the social space I engage within, and I always start with the development of the material. The purpose of altering the materials sourced from the food bank is to add economic value, which will subsequently go back into the cycle of exchange that is created through the production of the collection. What have reactions to your collection been like? Since the show, there have been a lot of requests to borrow the samples for shooting and enquires for orders, which has been very exciting. Additionally, I’ve been invited to show at Vancouver Fashion Week in March, which is very exciting opportunity. What are you most proud of about your work? As I have been working along side the Vauxhall Food Bank and Tesco and seeing all the waste production from food consumption, I really wanted to reappropriate this waste and make it beautiful. I think that creating a new fabric from waste has been my most proudest part of the collection. I started with waste cardboard, as I really loved the existing branded prints on the surface and wanted to use this with my collection. Through experimentation and research. I was able to separate the layers of cardboard by soaking it in water. I then fused these layers to organic cotton and laser cut this material into frames. The cardboard is then basket-woven. To create the garments, I had to devise a way to make the garments seamless through a weaving process. The pattern-cutting also made use of entire cardboard box, reducing waste. The new fabric feels like leather and is surprisingly soft to touch. Through the creation of this fabric I wanted to show that with time and effort you can create a beautiful material from a waste product.